Yeah for Spring! We are FINALLY getting into some warmer weather. We are finally seeing some green leaves on trees and flowers blooming. It seems like winter has lasted forever!! Such is life in the mid-Atlantic states I guess. Now. If I lived in Florida, the weather would be warmer, the trees would already be in bloom, and the produce would be plentiful!! Getting in the 5 fruits and veggies would be so easy in Florida. There’s a range of fresh food options there 24/7/365. We’re dying for winter to be over but Floridians are already noshing on a range of fresh produce that’s in season right now!! I could be whipping up some Florida Blueberry Cheesecake for a delicious Easter dessert. Or baking up some How about a Florida Blueberry Smoothie? They’re so popular now a days. I crave a sweet and luscious Florida Blueberry Cobbler or Blueberry Biscuit Cookies to share at work! YUM! Or even a sweet and tangy Florida Blueberry Key Lime PIE!! YUM! Since I’ve had brownies and bars on the brain, I think I’ll whip up some Florida Berry Snack Bars. Now those I could easily sink my teeth into. 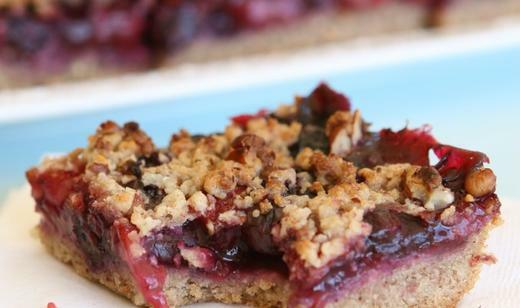 These bars are like a slab pie with a cookie crust. Stop licking the screen! You can easily make these beauties in your own kitchen. I thoroughly enjoy the easy to follow recipe and the tasty ingredients that make up these scrumptious looking bars. They’re almost a one bowl recipe! All the work is done in the food processor for the crust. Then simply simmer the berries with some sugar and cornstarch, assemble, bake, and voila! Berry Bars! Make sure to browse all the delicious recipes on the Fresh from Florida website. And don’t forget to link them on Facebook and follow them on Twitter. You won’t want to miss all the other tasty vittles they have to offer!